New York, July 18 – The UN Development Programme (UNDP) and the RISE Research Institutes of Sweden today jointly launched ‘SDG Trend Scanner’— a new initiative to explore ways to harness rapid and disruptive trends to help advance the 2030 Agenda and deliver on the 17 Sustainable Development Goals (SDGs). Disruptive trends are becoming increasingly important because they change the way we think, behave or do business. They uproot traditional thinking and alter the way we go about our day-to-day activities, as many of the technologies underpinning them are more powerful and interlinked than ever. The SDG Trend Scanner initiative will enable companies, the public sector, and other stakeholders to strategically use trends as drivers for accelerated progress towards the achievement of the Sustainable Development Goals, including by catalyzing scalable innovations and opportunities for public-private partnerships. “Disruptive trends in technologies, business models and values, sometimes perceived as threats, can be harnessed and leveraged to empower people and countries to pursue their development aspirations. 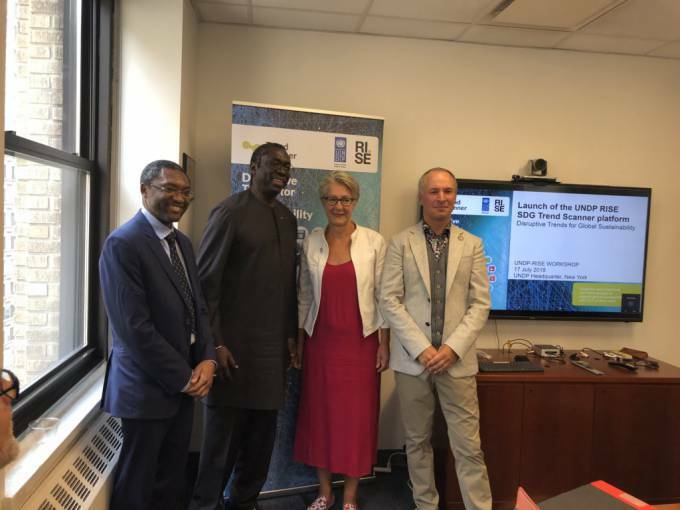 We look forward to working with RISE and explore the opportunities that our joint SDG Trend Scanner initiative provides,” said Abdoulaye Mar Dieye, UN Assistant Secretary-General and Director of UNDP’s Bureau for Policy and Programme Support. Through this joint initiative, UNDP and RISE will engage with key stakeholders such as the industry leaders, international organizations and academia to help facilitate a platform for collaboration and partnerships. The initiative will also explore ways for different stakeholders to leverage disruptive trends through collaborative research, innovative pilots in specific areas, development of new tools or expansion of existing tools to leverage trends for global sustainability, and capacity development of policymakers and relevant stakeholders towards the achievement of Sustainable Development Goals. “Global sustainability and the 2030 Agenda are rapidly emerging as key drivers for innovation. For RISE this collaboration is an important step towards our goal to become a stronger innovation partner for businesses and society. We will bring decades of innovation experience and look forward to use different parts of our organization in collaboration with UNDP to ensure a successful outcome of the SDG Trend Scanner initiative,” said RISE CEO Pia Sandvik.